Discussion in 'Traditional Folders and Fixed Blades' started by pistonsandgears, Jan 17, 2017. Nice find!!!! Good bone on that one, and that main blade still has a ton of life left in it. 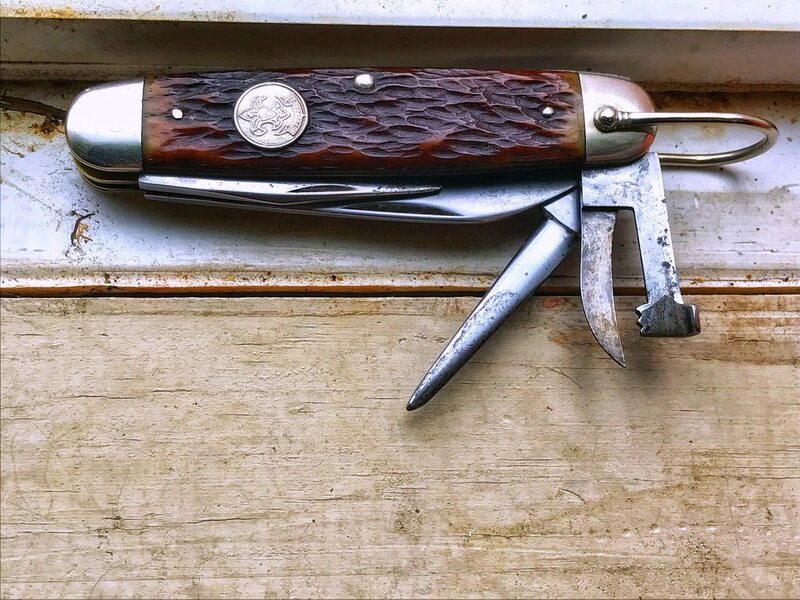 It's wonderful that so many of these knives can still be found, in very good condition, and for a modest amount of money. They've got a heck of a lot of bang for the buck, and you don't feel too bad adding a knife with such a low rarity to your EDC rotation. Yours looks maybe post-war. Brass liners. 3-line tang stamp. 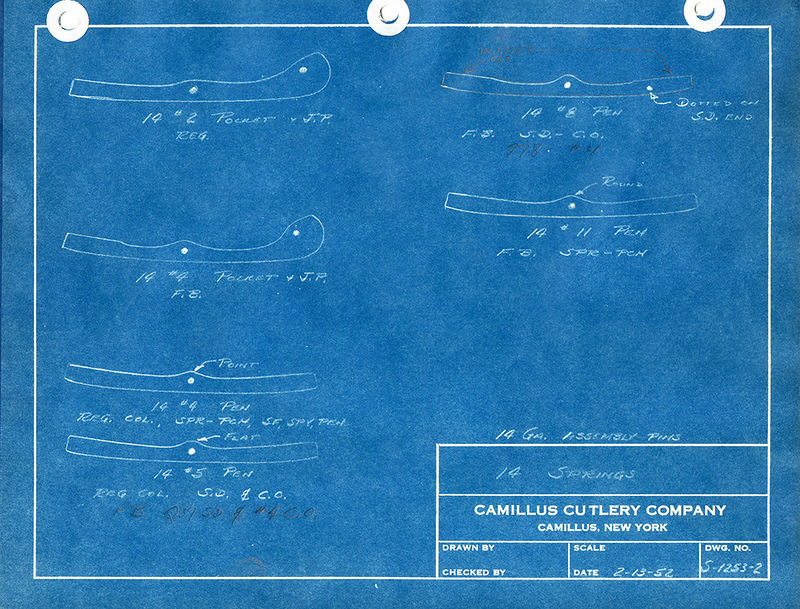 These were sold at PX's and such, and available through quartermasters, but most seemed to have 4-line tang stamps. Knives of the same exact pattern were sold on the open market after the war, but I don't have a clear understanding of whether the bone covered examples were confined only/mainly to the military. 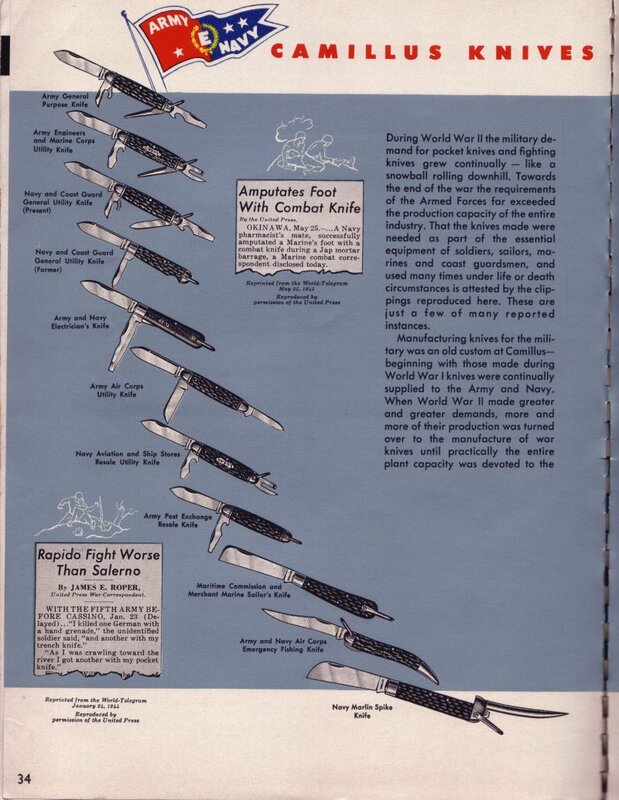 Lots of the post-war knives, and even some of the war knives, were covered in nasty shrinky-dink plastic, that reached its half life quite quickly. So yours is one of the tougher knives to pin down. It may be post-war, but could also have been a late-war model. 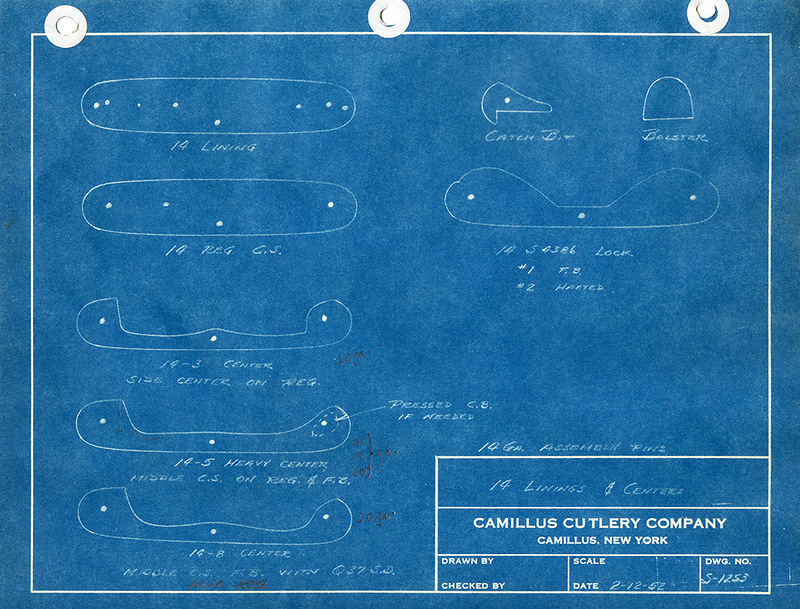 Camillus was playing with new tang stamps late in the war. The late-war era saw a mixture of bone and plastic being used, as the bone supply quickly dried up. I can say that yours is what Camillus called a 14/4. It's based on the 14 pattern with 4 blades. This pattern was used for a long, long time. Long before the war and even into the 1980's. Maybe longer. That's at least 50 years of manufacturing, and possibly more. There are tons of variations on the 14/4, usually cosmetic, but also featuring at least 4 different styles of can openers and at least 2 different caplifter/screwdriver varieties. Can you take a picture of the springs and liners for me, with the tools in the closed position? Thanks so much for the info Buzz! I really appreciate it. I could see where these knives could easily become addictive! Here are some additional photos. If you need more just let me know. afishhunter, veitsi_poika, waverave and 9 others like this. Needham, Eyre St, Sheffield All metal. afishhunter, veitsi_poika, Jolipapa and 12 others like this. navaja, wildmike, afishhunter and 14 others like this. Ooooh. That’s nice. That model has been on my watch list for the last few years. Yours is in wonderful condition. I'm a very happy camper today. I managed to acquire my first Remington scout last fall, and it was a very good one. 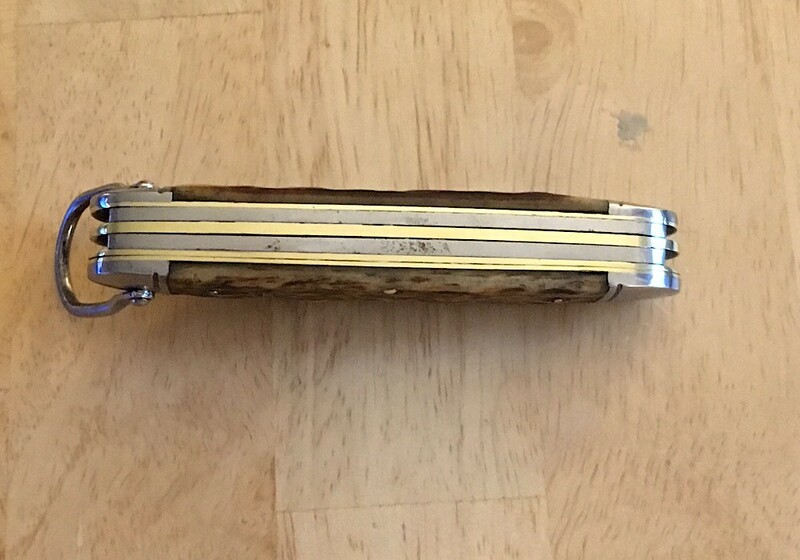 The only issues were a slightly short punch, a twisted bail, and some mostly cosmetic digs in the edge of the main blade. After getting that one excellent Remington, I embarked on a journey to find one that was as close to functionally perfect as possible. I tried a few auction Remingtons, as well a handful of bargain Pal scouts, but none of them totally panned out. I either ended up with short blades or cracked covers. Well I finally paid the piper last week, and ordered another Remington at a higher price than I'd ordinarily pay. Nothing too extravagant, but definitely outside my comfort zone. The new knife arrived in my mailbox yesterday, and I'm very relieved to say that it's in wonderful condition. I'm not sure if the spear blade has ever been sharpened, it's so long and full. The awl is so clean, it still has that bluish discoloration inside the scoop. The caplifter/screwdriver is full, with maybe just the slightest twist in the flathead tip. The two-piece can opener is in great shape. All tools are perfectly tight and properly crinked. 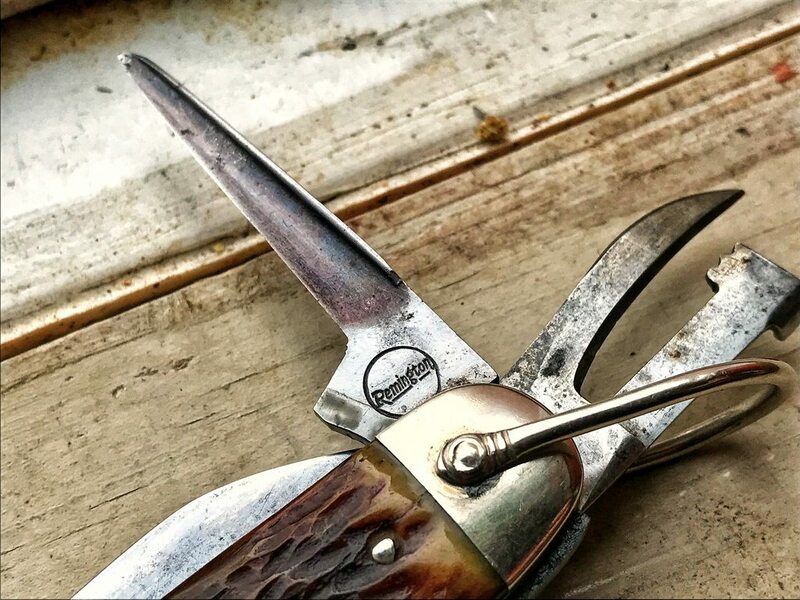 Every tool opens and closes with an authoritative snap. The Remington bone covers are flat out gorgeous, well matched, and have no noticeable cracks or chips. 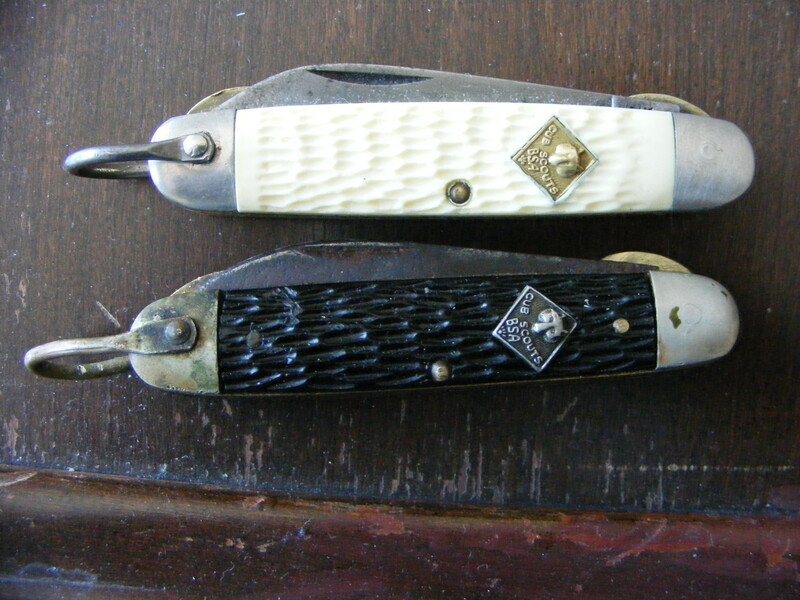 The tang stamps on both the main blade and punch are in great shape, as is the BSA shield on the mark side cover. The bail is even straight. I'd say that the only problem with the knife is that somebody tried to clean it up a bit at one point, and removed most of the patina. But that I can add back on, so it's not a huge issue. I'll be doing that at my earliest convenience, because I hate the look of an antique knife that's obviously had the patina removed. I hate to say it, but I think I may have now hit somewhat of an endpoint in my scout collecting. 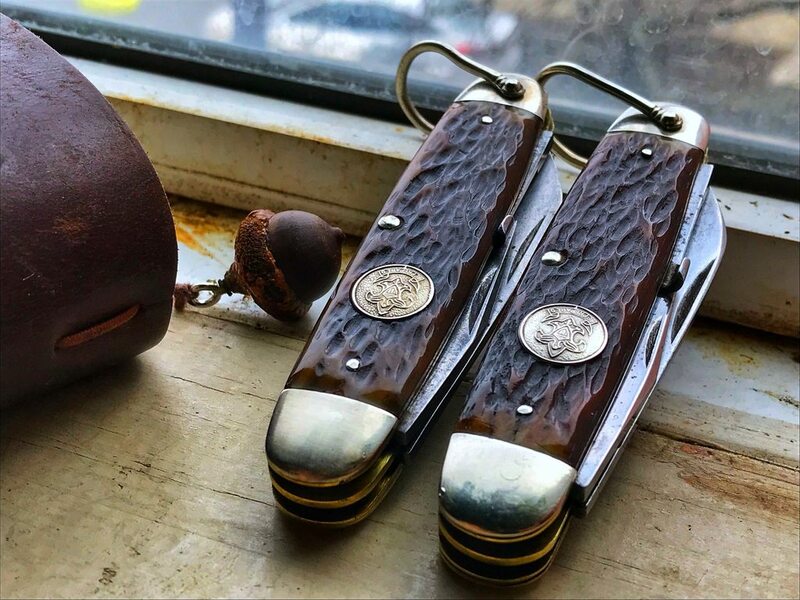 My scout search has always been about finding that perfect knife to use. I've nailed my perfect scout model down to either the Camillus Engineer knife or the Remington RS3333 BSA knife, and I now have two excellent examples of both knives, that aren't so crazy rare that I'm afraid to use them. All that's left is for me to finish my long term evaluation of the Camillus, and to perform the same testing on the Remington. R.c.s, afishhunter, veitsi_poika and 12 others like this. This new Remington is bizarrely similar in appearance to the one I bought last fall. Definitely kissing cousins. HST, R.c.s, afishhunter and 10 others like this. Nice duo Buzz. Those Remingtons are excellent Knives. waverave, HST, R.c.s and 11 others like this. So much goodness in one knife. 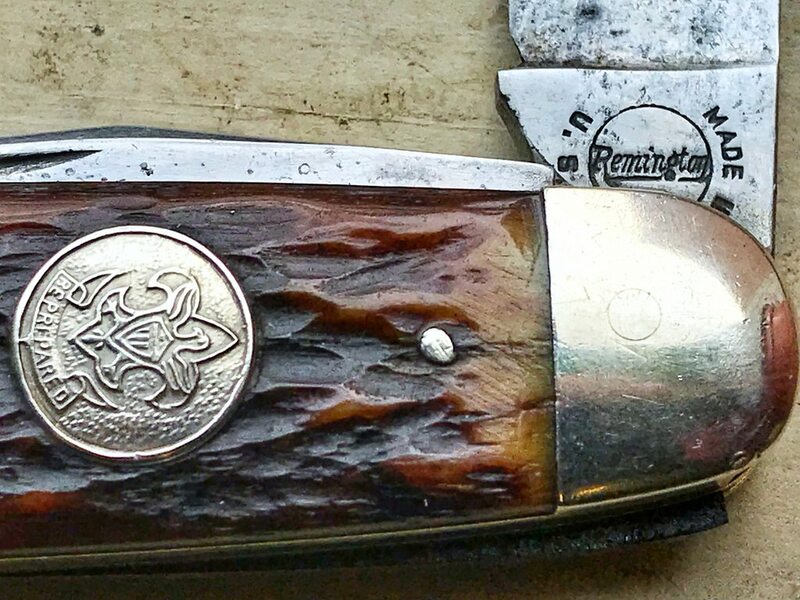 Epic Remington styling, awesome shield, beautiful worn bone, and a nice dark patina. It’s a keep for sure!!! Superb Photograph...wow !! The knife is a gem !!! Thank you Buzz. Very kind. Superb Photograph...wow !! The knife is a gem ! This Imperial Cub has a steel shield and lacks the symmetrical double crink of the Camillus. waverave, HST, R.c.s and 6 others like this. I REALLY like the steel shield on your Imperial! It's funny, but I thought I had cleaned this up when I bought it. When I bought it, I had the feeling it had been dipped in tar and run over a few times in a pothole in a gravel road. 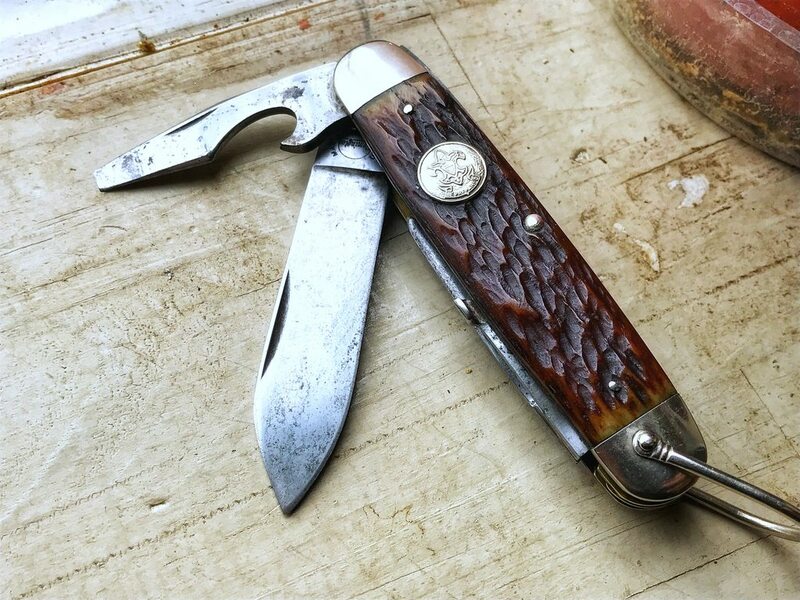 Maybe I just loosened up the blades with penetrating oil, oiled the rust, and called it good. Anyway, I have gone after it with a toothbrush and scouring powder, then with some emery cloth, and of course more oil. Much improved. Fodderwing and Buzzbait like this. A couple of imperials from the 1936-52 era that are a little different from each other. 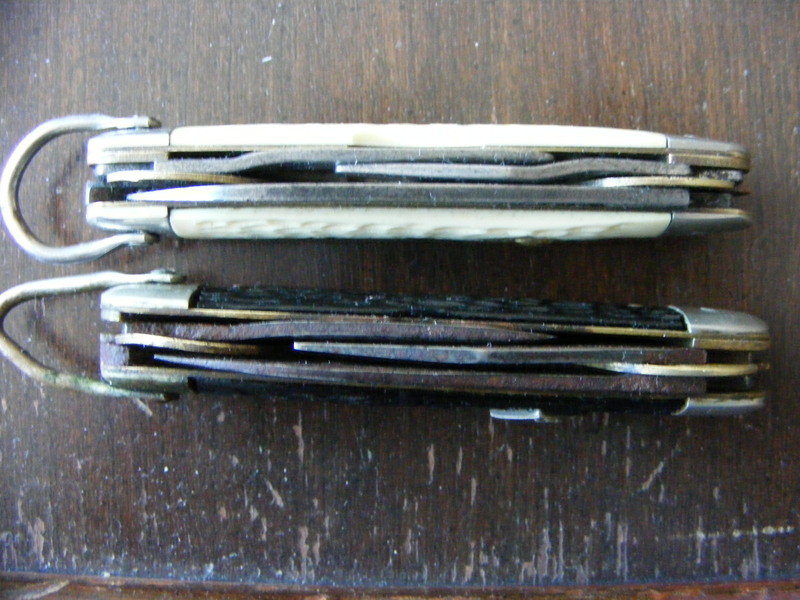 Both are in original condition with very little use and each still has the factory edge on the main blade. navaja, waverave, Campbellclanman and 11 others like this. 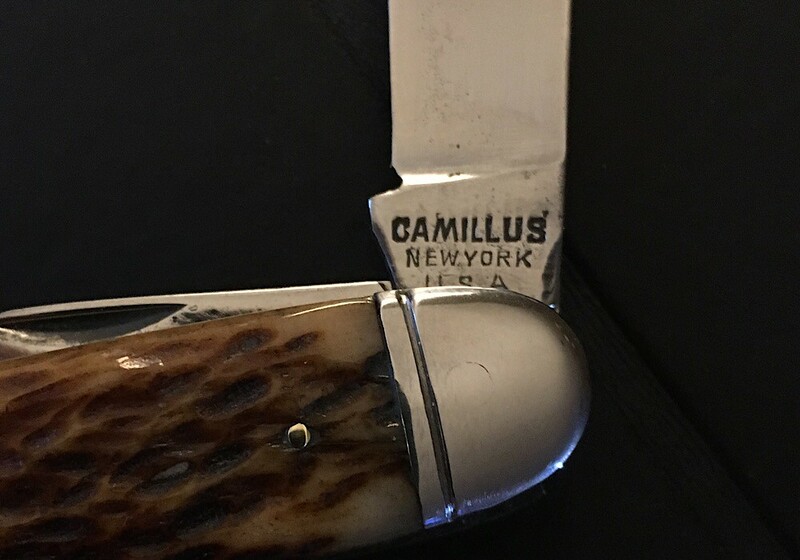 ...and this Camillus from an antique shop...both in great working condition. 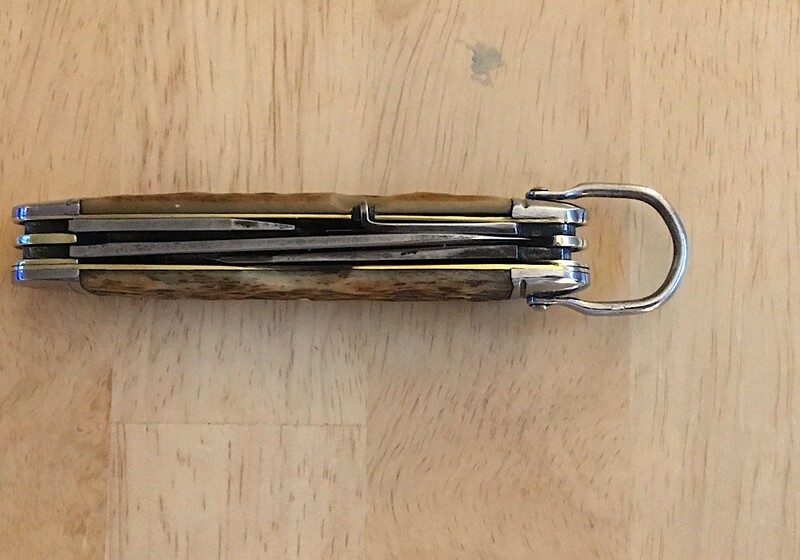 navaja, afishhunter, Dschal and 7 others like this. 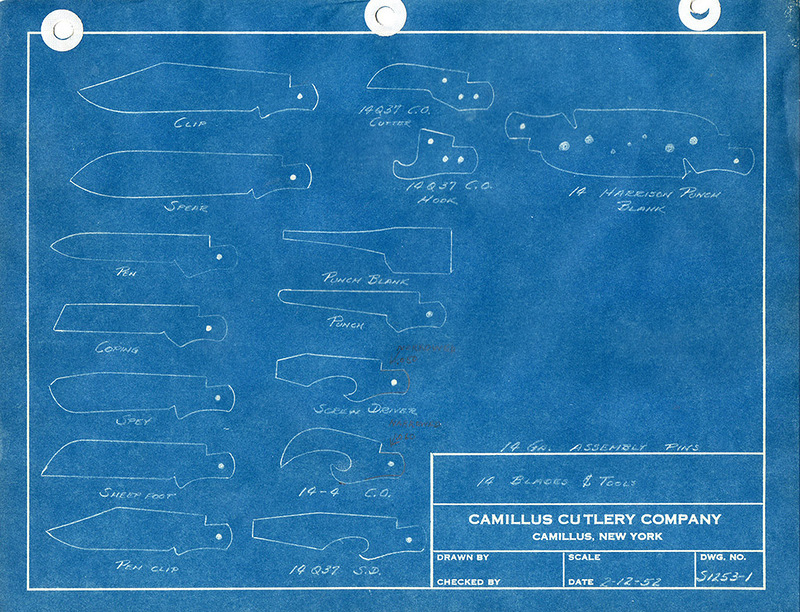 I dig the Camillus. It's nice to see a scout with a secondary blade. The lack of a second blade on a traditional scout design is the one thing I don't like about it. I always want that extra small blade for detail work and digging out splinters. I've been meaning to take pictures of my Imperials. I have a couple of plastic handled ones in the same style, with the pen secondary instead of the awl. One is so mint it still has the corrosion resistant paper, with instructions printed on it, that the knife came wrapped in. I'll see if I can snap some pics this weekend.